The prevalence of GDM in India varied from 3.8 to 21% in different parts of the country, depending on the geographical locations and diagnostic methods used. GDM has been found to be more prevalent in urban areas than in rural areas. It is Important to monitor because it impacts maternal health care both during/after pregnancy and increases perinatal complications. Gestational diabetes affects the mother in late pregnancy, after the baby’s body has been formed, but while the baby is growing. Because of this, gestational diabetes does not cause the kinds of birth defects sometimes seen in babies whose mothers had diabetes before pregnancy. Generally women who are 25 years of age, Overweight or obese state, with Family history of diabetes mellitus, History of abnormal GTT, History of poor obstetric outcome, History of delivery of an infant with a birth weight > 9 lbs , History of polycystic ovary syndrome, Asian origin. In the antenatal clinic, a pregnant woman after undergoing preliminary clinical examination, has to be given a 75 g oral glucose, without regard to the time of the last meal. A venous blood sample is collected at 2 hours for estimating plasma glucose. GDM is diagnosed if 2 hr plasma glucose is ≥140 mg/dl. American Diabetes Association recommends 3 hour 100 gm OGTT and Gestational Diabetes Mellitus is diagnosed if any 2 values meet or exceed FPG > 95 mg/dl, 1 hr PPG > 180 mg/dl, 2 hr PG > 155 mg/dl and 3 hr PG > 140 mg/dl. Screening is recommended between 24 and 28 weeks of gestation and the diagnostic criteria of ADA are applicable. A team approach is ideal for managing women with GDM. The team would usually comprise an obstetrician, diabetes physician, a diabetes educator, dietitian, midwife and pediatrician. Intensive monitoring, diet and insulin is the corner stone of GDM management. A short term intensive care gives a long term pay off in the primary prevention of obesity, IGT and diabetes in the offspring, as the preventive medicine starts before birth. Primary requisite is the need for glucose monitoring. Diet control should be initiated. If still poor control persists, insulin should be commenced. The most advised format is Self-monitoring of blood glucose (SMBG). Maintaining a mean plasma glucose (MPG) level ~105–110 mg/dL is desirable for a good fetal outcome. This is possible if FPG and 2-hour postprandial peaks are ~90 mg/dL and ~120 mg/dL respectively. All women with GDM should receive nutritional counseling. The meal pattern should provide adequate calories and nutrients to meet the needs of pregnancy. The expected weight gain during pregnancy is 300–400 g per week and total weight gain is 10–12 kg by term. Once diagnosis is made, medical nutritional therapy (MNT) is advised initially for 2 weeks. If MNT fails to achieve control, i.e. FPG ~90 mg/dL and/or post-meal glucose ~120 mg/dL, insulin may be initiated. The success of the treatment for a woman with GDM depends on the glycemic control maintained with meal plan or pharmacological intervention. Self-monitoring of blood glucose self-monitoring of blood glucose (SMBG) on a daily basis, failing which, at least weekly monitoring should be encouraged. Gestational diabetic women require follow-up. An OGTT with 75 g oral glucose, using WHO criteria for the non-pregnant population should be performed at 6–8 weeks postpartum. If found normal, glucose tolerance test is repeated after 6 months and every year to determine whether the glucose tolerance has returned to normal or progressed. A considerable proportion of gestational diabetic women may continue to have glucose intolerance. It is important that women with GDM be counseled with regard to their increased risk of developing permanent diabetes. Therefore, along with the usual healthcare delivered by the obstetrician or gynaecologist, pregnant women with gestational diabetes will require other healthcare professionals including a diabetologist, dietician, diabetes educator to effectively manage their health and well-being. If a woman already has type I or type II diabetes, it is essential to discuss with the doctor before becoming pregnant, as poorly controlled blood sugar levels can seriously impact the baby’s health. There are no guarantees in preventing Gestational diabetes mellitus but adopting healthy habits before pregnancy is always a better option. A few healthy choices like eating healthy food- high on fiber and low in fat, focusing on vegetables, fruits and whole grains and most importantly exercising before and after pregnancy can be of major help. Focusing on permanent changes in eating habits, motivating yourself by remembering the long-term benefits of losing weight help in reducing the risk of having diabetes in the future or developing type 2 diabetes down the road. 1. Is my baby at risk now I have gestational diabetes? Gestational diabetes affects the mother in late pregnancy, after the baby’s body has been formed, but while the baby is growing. Because of this, gestational diabetes mellitus does not cause the kinds of birth defects sometimes seen in babies whose mothers had diabetes before pregnancy. So the baby might not be at risk most of the times. But there might be higher chances of the baby becoming obese in future. Exercise and healthy diet are always the best prevention methods. 2. Will I still have diabetes after the baby is born? Some new mothers have better blood glucose control in the first few weeks after delivery. For many, it’s a period of odd blood glucose swings. If you have gestational diabetes, there is a very good chance that your diabetes will go away immediately after the delivery. If the condition still persists, it is always advised to consult your doctor and continue medication. 3. Will I have to be induced now that I have gestational diabetes? However, women can technically be treated as ‘normal’ if their gestational diabetes is well controlled and baby’s growth looks normal on a 32 week scan. Many OB’s cite the risk of stillbirth as a reason for induction, because the risk of stillbirth in women with regular diabetes is higher. However, there is no evidence that the risk of stillbirth goes up in gestational diabetes. So it is not necessary that having gestational diabetes mellitus needs induction od delivery. 4. Will I need a Caesarean section now that I have gestational diabetes? A caesarean section might be required if it is suspected that the baby is 4,500 grams or higher, according to the American congress of Obstetricians and Gynecologists. In other cases f the glucose is under control, c-section is not required. 5. What should I expect at my first diabetes clinic appointment? A care team at the clinic usually comprising an obstetrician, diabetes physician, a diabetes educator, dietitian, midwife and pediatrician. Intensive monitoring, diet and insulin is the corner stone of GDM management. A short term intensive care gives a long term pay off in the primary prevention of obesity, IGT and diabetes in the offspring, as the preventive medicine starts before birth. 6. What can/can’t I eat? 7. Will I need to take medication or insulin to control my gestational diabetes? Once diagnosis is made, medical nutritional therapy (MNT) is advised initially for 2 weeks. If MNT fails to achieve control, i.e. FPG ~90 mg/dL and/or post-meal glucose ~120 mg/dL, insulin may be initiated. The success of the treatment for a woman with GDM depends on the glycemic control maintained with meal plan or pharmacological intervention. 8. Can a pregnant woman get diabetes? Pregnant women who have never had diabetes before but who have high blood glucose (sugar) levels during pregnancy are said to have gestational diabetes. It is Important to monitor because it impacts maternal health care both during/after pregnancy and increases perinatal complications. 9. At what point will my diabetes consultant want to put me on medication or insulin? 10. What tests are used to diagnose gestational diabetes? 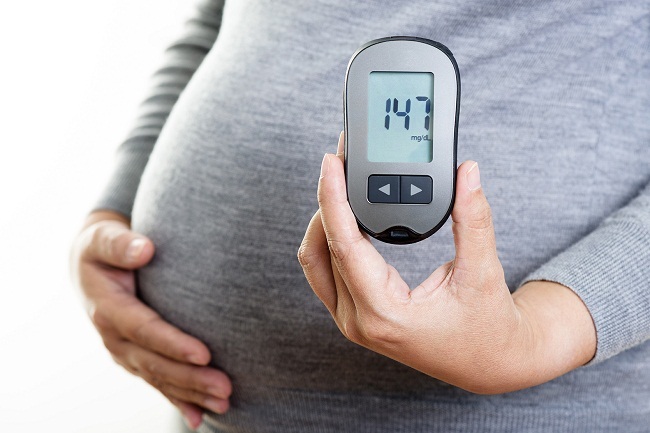 Gestational diabetes mellitus is diagnosed if 2 hr plasma glucose is ≥140 mg/dl. American Diabetes Association recommends 3 hour 100 gm OGTT and Gestational Diabetes Mellitus is diagnosed if any 2 values meet or exceed FPG > 95 mg/dl, 1 hr PPG > 180 mg/dl, 2 hr PG > 155 mg/dl and 3 hr PG > 140 mg/dl. 11. Signs of gestational diabetes mellitus? Gestational diabetes typically does not cause any noticeable signs or symptoms. This is why screening tests are so important. Rarely, an increased thirst or increased urinary frequency may be noticed. 12. Diet of gestational diabetes mellitus? It is not necessary to go on a special diet when have gestational diabetes. Depending on your current diet, you may have to eat less of some foods and more of others. The main aim for managing gestational diabetes is ensuring that your blood glucose levels are under control, so your healthcare team will discuss targets that are right for you. Ask to be referred to a dietitian who can support you to come up with a specific eating plan that is tailored to your needs. 13. Gestational diabetes effects on baby? Gestational diabetes may also have some effects on the baby’s health. High insulin levels in the baby (caused by high blood glucose levels in the mother) may lead to low blood glucose levels in the baby after birth, so the baby is more likely to need to be cared for in a specialist baby unit in the hospital. Because your baby may be larger than normal, he or she is at higher risk for these complications. Remember, these are just possible complications. Your baby might have none of them. 14. What are ketones and how can I prevent them? Ketones are the result of the body burning fat for energy or fuel. For a person with diabetes, ketones are often the result of prolonged high blood sugar and insulin deficiency. Stringent control on blood sugars is the key in controlling ketones in the body. The presence of ketones can quickly become a dangerous condition called diabetic ketoacidosis, which is a serious medical emergency, and requires prompt treatment. 15. Does Metformin have any effects on the baby? There are no known side effects to the baby from taking Metformin in pregnancy. However, studies are going on to check the long-term side effects on babies born from mothers who took metformin during pregnancy. Treatment for gestational diabetes aims to keep blood glucose levels equal to those of pregnant women who don’t have gestational diabetes. Treatment for gestational diabetes always includes special meal plans and scheduled physical activity. It may also include daily blood glucose testing and insulin injections. Maintaining a mean plasma glucose (MPG) level ~105–110 mg/dL is desirable for a good fetal outcome. This is possible if FPG and 2-hour postprandial peaks are ~90 mg/dL and ~120 mg/dL respectively. 18. I feel sick and shaky and I’m sweating, what is wrong with me? What you probably experienced were symptoms of low blood sugar called as hypoglycaemia. This happens when the blood sugar falls below 72mg/dl. It is very important for you to realise the symptoms and take immediate action. The symptoms of hypoglycaemia initially are sweating, tremor, hunger, anxiety, shakiness, headache, confusion, irritability, lack of concentration and if left untreated, hypoglycemia can get worse and may cause confusion, clumsiness, fainting, fits or even coma. Ideally, when possible, low blood sugar should be confirmed by measuring the blood glucose level. 19. If I have another baby will I get gestational diabetes again? There are many factors that affect how likely you are to develop gestational diabetes. While some of these, such as your ethnic origins, are out of your control, there are others that you can do something about. Making positive changes now will only benefit you and your next baby. Aim to be a healthy weight before you get pregnant. Try to bring your BMI (body mass index) below 25. Try not to put on weight between pregnancies. If you knew your BMI before your last baby, try not to add more than three BMI points to your pre-baby score. Putting on weight may mean you’re more likely to develop gestational diabetes again. It may also increase your risk of developing type 2 diabetes in later life. Regular exercise, healthy diet are the two key concepts in keeping gestational diabetes mellitus at bay.